The AG-UX90 is the “UX-series standard model” for easy, high-quality 4K/FHD recording. It is equipped with a newly designed compact lens featuring a wide 24.5mm angle and 15x optical zoom. Its Optical Image Stabilizer (O.I.S. ), intelligent AF function, and Manual Three Rings are ideal for professional camera work. Panasonic’s AG-UX90 features a 1.0-type high-sensitivity MOS sensor and is capable of shooting in UHD 25p and FHD 50p/25p multi-format recording. As well as 4K (UHD) high resolution, it delivers premium FHD recording at 50 Mbps. Two SD memory card slots enable relay/simultaneous recording and guarantee backup storage space. Additionally, the AG-UX90’s build and operating ease will feel memorable to professional photographers, and enjoys a wide range of interfaces, including HDMI output and XLR input. 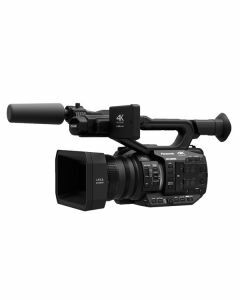 Providing the same level of versatility and hardiness as a conventional HD handheld camcorder, the AG-UX90 offers potent support for high image-quality 4K/HD video production.